Panna cotta – literally ‘cooked cream’ – is often cloying, heavy, dull, and not to mention ubiquitous. However, this version is light and refreshing, and suitable for vegetarians as it’s made with vegetarian gelatine. Serves 4. 1. 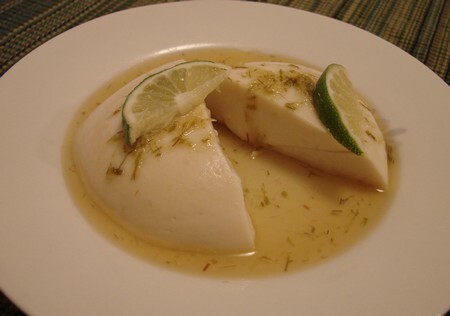 Heat the coconut milk in a saucepan, along with cream, lemongrass, and lime rind. Bring to the boil, then remove from the heat. Cover the saucepan and leave aside to cool. 2. Once cooled, remove the lemongrass from the coconut milk and discard. Add sugar, and sprinkle in the gelatine. Stir quickly and continuously to prevent lumps from forming. 3. Place the saucepan back on low heat, and stir the coconut milk continuously until it is just starting to boil, then immediately remove from the heat. 4. Pour the coconut milk mixture into 4 individual ramekins, levelling the top. Leave in a cool place to set, but do not refrigerate. 5. Make the syrup by gently heating sugar, water, ginger, and lime rind and juice in a small saucepan until the sugar dissolves completely. Remove from the heat and set aside. 6. When the panna cotta has set, carefully turn it out onto individual serving plates, and drizzle each portion with the ginger syrup. 7. Place panna cotta in the fridge until ready to serve. Before serving, garnish with the scented leaves if using.